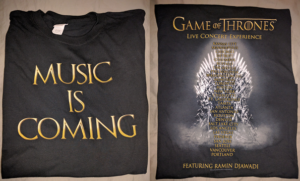 ‘Game of Thrones’ Concert T-Shirt Giveaway! On Monday HBO and LiveNation announced an epic concert tour featuring the music from Game of Thrones, written by Ramin Djawadi. Fans at the special announcement at the Hollywood Palladium in Los Angeles, CA were treated to a special performance by the USC Trojan band, an exhibit that featured costumes, and a chance to sit on the Iron Throne. They also received an exclusive T-shirt featuring the words “Music Is Coming” on the front, and on the back an image of the Iron Throne overlaid with the names of the cities that will be visited on the tour. Well, we’ve got one of those shirts in a size Large, and one lucky reader is going to win it! You have until Friday, 19th of August at 8pm PT to enter when we’ll randomly select our winners. * Because of the prohibitive cost of shipping abroad, we regret that this contest is only available to participants in the United States. You are so sweet and so are those shirts. I love the Game of Thrones. I sometimes find myself rooting for the bad guys because life shook them up a little. Even the good guys have a down fall. Every character is so well written too. I’m a Facebook fan as Lexi Blanco and liked the post there too.